"...a very small valley...[R]avines are typically classified as larger in scale than gullies, although smaller than valleys. A ravine is generally a slope landform of relatively steep sides...Ravines may or may not have active streams flowing along the downslope channel which originally formed them..."
As you all hopefully know, the RF II races down a bluff (steep hill) and over a four-lane highway ravine as the original ride did, hence the name of the coaster. So that's why it's called the RAVINE Flyer II! Now you can tell all your friends and look like a roller coaster expert! PEPSI OR MOUNTAIN DEW CANS - These do NOT have to be specially marked. One can (empty or full) is good for two people. Choo Choo! All aboard! Yeah, I know that was lame, but my creativity's currently on break. Anyways, this is the new train route that goes underneath the RF II. I don't know why, but the video is pretty shaky (I was not being chased by the train or experiencing an earthquake). Maybe if you nod your head with the shakes it will look normal...I also got footage of the coaster as it went by (this part isn't shaky), mostly just the beginning and end of the ride. This concludes my video-binge for the week. I hope you've enjoyed the newest videos! It's gray, boxy, and shoots out money...what is it? Our new ATM in the Gift House of course! Woohoo! Look at all that pretty merchandise around it too: hats, souvenirs, jewelry, apparel, even temporary airbrush tattoos! FACT: That's bologna. Someone was confused about our fireworks night rule. ON FIREWORKS NIGHTS ONLY: (This rule starts in the evening) Anyone under 20 years old not accompanied by a parent must buy a Ride-A-Rama ($19.45) to enter the park. 2008 Fireworks nights are May 25 and 26, July 3 and 4, and August 31. Maybe he took his campaign team for a field trip? Yup, that's John. It looks like he's enjoying himself. I guess we can officially say that 2008 Presidential Republican nominee John McCain endorses the Ravine Flyer II at Waldameer. To Waldablog readers: Unfortunately, this isn't John McCain...and he does not in fact endorse us. To John McCain: Joke? Haha? Waldameer is the 10th oldest amusement park in the U.S.
Also, out of over 1,000 original trolley parks in the U.S. ...drumroll...Waldameer is one of the 11 still in operation today. "In the United States, trolley parks, which started in the 19th century, were picnic and recreation areas along or at the ends of streetcar lines in most of the larger cities. These were precursors to amusement parks. These trolley parks were created by the streetcar companies to give people a reason to use their services on weekends. These parks originally consisted of picnic groves and pavilions, and often held events such as dances, concerts and fireworks. Many eventually added features such as swimming pools, carousels, Ferris wheels, roller coasters, sports fields, boats rides, restaurants and other resort facilities to become amusement parks." No, girls, not the band. I'm talking about the temperature yesterday...okay, the temperature in my car sitting in the hot sun all day. But really, the actual high yesterday was 92° F which is definitely impressive for Erie. (Ask an...Erieite...Erien?...someone who lives in Erie about the weather, especially our winters.) It was a very hot and busy day. Q: Ever wonder why the new Ravine Flyer II is called 2? A: There was a coaster by the same name that ran from 1922 to 1938 until it was shut down. Okay, that was ridiculously easy: everyone knows there was a number 1 if there's a number 2 and 3 today. The RF II opened this season and the RF III (kids' coaster) opened a few years ago. Q: Now for the big boy (or girl) questions. The original Ravine Flyer ran from 1922 to when? A: The ride was torn down in 1938. Q: Waldameer had an unusual attraction sometime before the late 50's. It included animals. What was it called? A: Monkey Island. And yes, as the name implies, it did have monkeys and they were on an island. They frequently escaped their home and roamed the park. 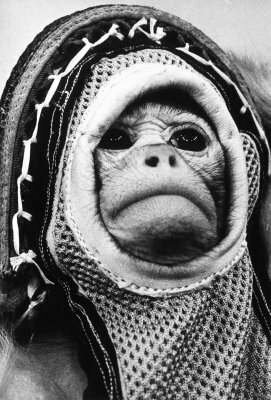 The monkeys were taken to be used as "spacemonkeys" for NASA space programs. Monkeys in space...hmm...where have I heard that before? Q: Okay, go back in time even more. Waldameer was originally a picnic grove called what? A: Hoffman's Grove. The Erie Electric Motor Company leased the park in 1896 (this is our 113th season) and renamed it Waldameer. Q: Back to the future! Your final question: Waldameer sold its original carousel in 1988 for how much money? What did they use that money for? A: Over $1 million which was used to purchase a new carousel and new waterpark attractions. Well, this concludes your first Walda-History lesson. Hopefully, you passed with flying colors (by actually knowing it or by cheating). If not, you should now be an expert. That's all for now, folks!